Stockton University on Tuesday, April 9, 2019. Submissions will be accepted until Friday, February 8, 2019. The students in the Master of Arts in American Studies (MAAS) Program at Stockton University invite proposals for presentations to its first graduate student conference on Tuesday, April 9, 2019. The theme of this conference is the United States and its global impact. This conference aims to provide students enrolled in a Master’s-level program, and students enrolled in the first years of a doctoral degree program, the opportunity to present their research interests in a formal academic setting. Participants may submit proposals for papers or for general presentations. Proposals should be related to where the U.S. fits into the world on a global level. For example, topics may include education, politics, military, cultural imperialism, settler colonialism, U.S. exceptionalism, or transnationalism in U.S. art, literature, or culture. Applicants should also feel comfortable submitting proposals related to the general subjects of the U.S. and its international impact or influence. The theme of each panel session will be determined based on the proposals that are selected for presentation. The conference will take place on Tuesday, April 9, 2019 at Stockton University, 101 Vera King Farris Drive, Galloway, NJ 08205. 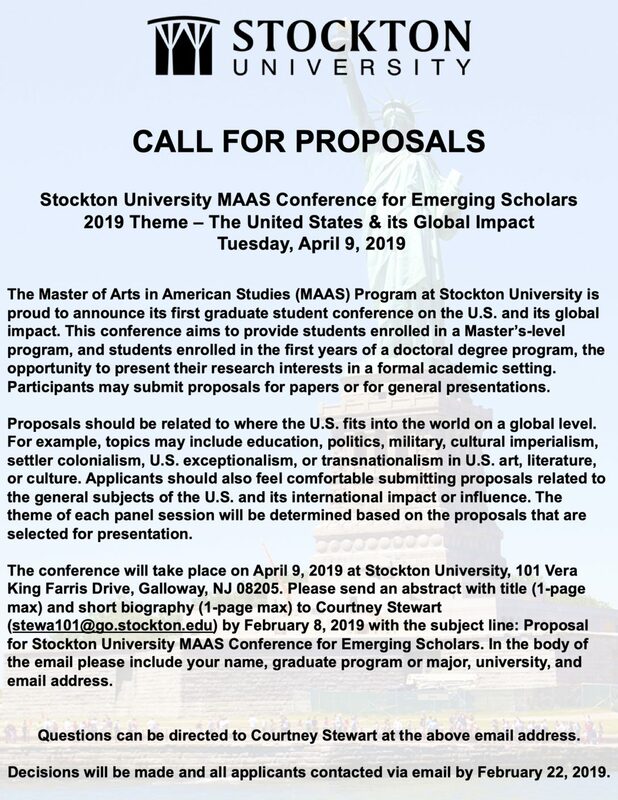 If students are interested, please send an abstract with title (1-page max) and short biography (1-page max) to Courtney Stewart (stewa101@go.stockton.edu) by February 8, 2019 with the subject line: Proposal for Stockton University MAAS Conference for Emerging Scholars. In the body of the email please include your name, graduate program or major, university, and email address.